About Us – Gary McDonald and Son Inc.
Do you know what the 3rd most popular TED Talk of all time is? It was published in 2009, and it’s all about Why. I urge you to click over and watch it right now. It’s only 18 minutes long. I’m not as eloquent as the presenter in that video. But if you’ll bear with me, I’d like to share with you my Why. The Why of McDonald Pools. Northern California is blessed with—almost synonymous with—beautiful vistas. Views of sun-kissed hilltops overlooking vineyards, meadows, and nature preserves—perhaps a small redwood grove off to the side—pop into mind when we think of this gorgeous land. The choking smell of chlorine. The bloodshot eyes of children who, after playing in the pool all afternoon, toddle around disoriented and exhausted from fighting the toxic burden of pool chemicals. Another thing that is so out of place: stiff, uninspired rectangles that contrast with nature’s curves like giant Lego blocks. I believe a pool should be so much more than that. And at the same time, so much less. 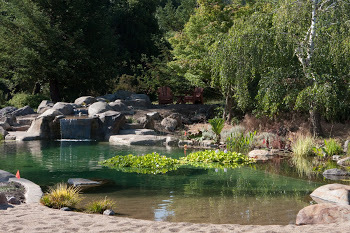 I believe a pool should reflect the same raw, natural beauty of this amazing land we are so fortunate to enjoy. It should reinvigorate us the same way views like these make us pause, breathe deeply, and remember our Why—our reason for being. They inspire us, energize us—reaffirm who we are and what we aspire to be. I believe a pool should do all this by mimicking nature, without any harsh chemicals. Lines curving organically, blending with the environment. With minimal energy spent on maintenance. Did I mention the water is so clean, you can drink it? I believe everyone should have swimming pools that are as pristine, healthy, and beautiful as this wonderful Northern Californian land where I live. I want everyone to know that a non-toxic pool is an option. I want our children to grow up playing in clean, pure water—not chemicals. Swim in water, not chemicals. Most swimming pools are in a delicate balance, maintaining levels of toxic chemicals at just the right point so that they kill everything in the water, but come just shy of killing you. What if you could have clean, crystal clear water without all the chemicals? What if you could swim in water that you could actually drink? Welcome to the world of natural swimming pools. 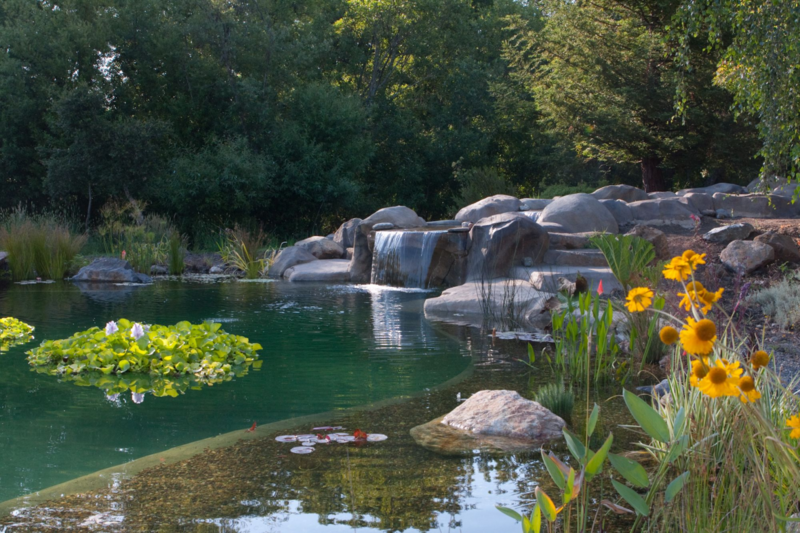 Natural swimming pools use plants, bio-filters, aeration and UV lights to keep water clean and clear with less maintenance and no harsh chemicals. We can build one for the same price as a typical covered pool.